Winning the Silver Sailfish Derbyis where preparation meets persistence and a bit of luck; perhaps it’s fate. A tournament unlike any other that offers opportunity to be a part of a storied history. 43 boats took to the water this year in early January to compete in the 82ndrunning of this prestigious sailfishing tradition, chasing fish and seeking the thrill of winning that only the best of the best have been able to achieve. Crews were greeted by cool weather and northwest winds the first day of fishing out of Palm Beach Inlet. Capt. Joe Garberoglio and his crew aboard the 60’ Viking, Fragrant Harbor,found the sails and took an early lead. They were able to maintain throughout the day, earning Top Boat honors Day 1 with 9 sailfish releases. 4 fish separated team Sparhawkfrom the lead, as Joe Ferrulle and crew ended the day of fishing in 2ndplace with 5 releases. Several teams, including past DerbyChampions, Southern Runand the Native Sonfishing team, put themselves in a position to make a run at winning it all headed into Day 2, posting 4 releases each. A total of 78 sails were released at the conclusion of Day 1. The 2ndand final day of the Derbywould produce 45 more fish than the following day, as the fleet recorded 123 sails bringing the grand total to 201 releases throughout the tournament. Another cool morning in the low 50s and a northwest wind would start things off, only to have the wind switch around and blow out of the east for the final hours of the event. This changed sparked the bite as several teams hooked doubles, triples and even quads in the 4-line Derby. The 90’ Bayliss, Singularis, would taste redemption as they released 10 fish after having none the day before. The 10 releases would top the fleet, as Capt. John Van Dellen and crew claimed the title of Top Daily Boat on Day 2. The Singulariswas not alone in their “donut day”; The Reel Captivatingalso struggled to find fish the 1stday. Capt. Travis Ralph and his A-Team bounced back releasing 8 sails on Day 2, tagging 6 of them, earning the Top Tag Team award. 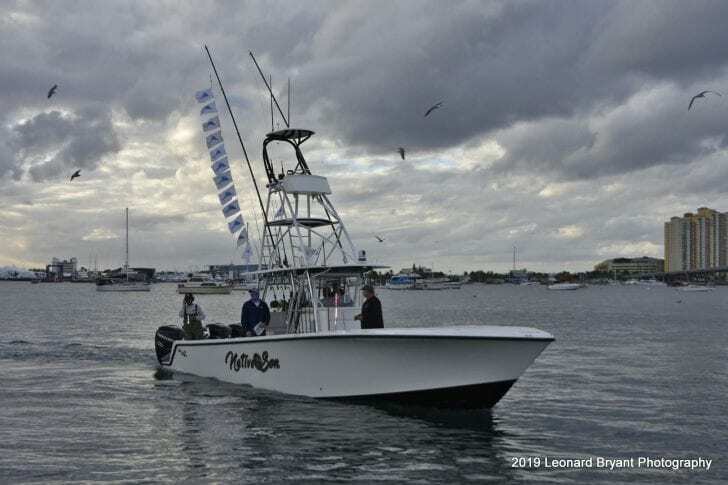 The ever consistent 39’ SeaVee, Native Son, would again make their mark on the leaderboard with the 3rdmost releases on the day, beat out on time, with 8 fish. Holding onto the lead makes minutes feel like hours and hours feel like days. David & Lynne Henderson, Trent Glaub, Ryan Hullihan, Owen Buckman, Tim Smith and Capt. Garbo of Fragrant Harborexperienced this phenomenon. 3 fish were leadered and released by the crew early. The rest of the day was silent until 1 final fish later in the day. 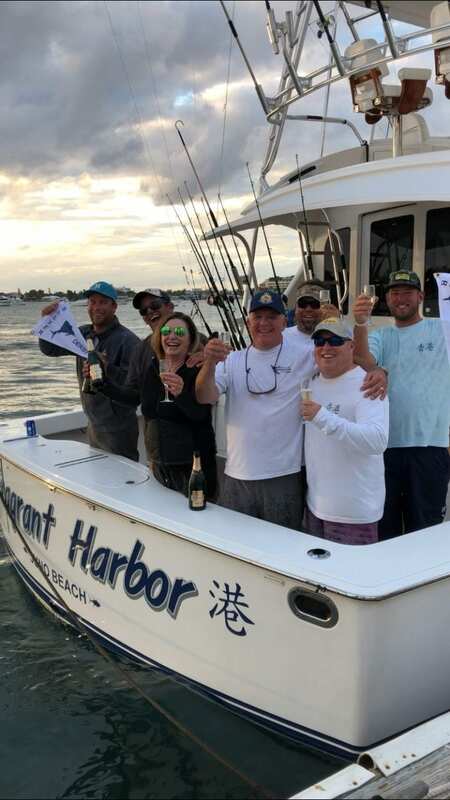 A total of 13 releases was enough for Fragrant Harborto claim their spot in the sailfishing history books as the winners of the 82ndannual Silver Sailfish Derby. The crew celebrated with a champagne shower after tying up to the floating dock at Sailfish Marina on Singer Island. A steady parade of fellow participants congratulated the winners as they passed by the dock, raising a glass in an act of comradery. The Derbyis hosted by the West Palm Beach Fishing Club (WPBFC) and continues to be the organization’s marquee event. Part of what makes the event so special are the people involved. Many Derbyawards are sponsored by families who have been associated with the event for decades. 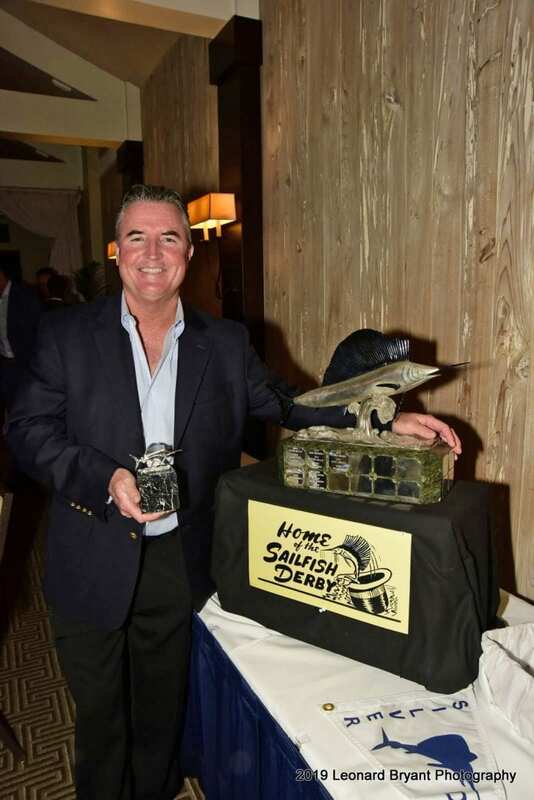 The Derby’stop angler award is the Mrs. Henry R. Rea trophy, a magnificent silver sailfish sculpture that dates back to the event’s origin in 1935 and is sponsored by Elizabeth Richebourg Rea of Connecticut. The Rea Trophy remains one of the crown jewels in all of angling. Mark Donohue of Jupiter earned the Rea Trophy this year aboard the Singularis, landing 6 sailfish all in one day. He is only the sixth individual to win the Rea Trophy more than once in the tournament’s 82-year history. The Top Lady Angler trophy is sponsored by the Hampp Family of New Jersey in memory of Rose Hampp, who won the honor in the 1957 Derbyalong with many other awards throughout her accomplished angling career. 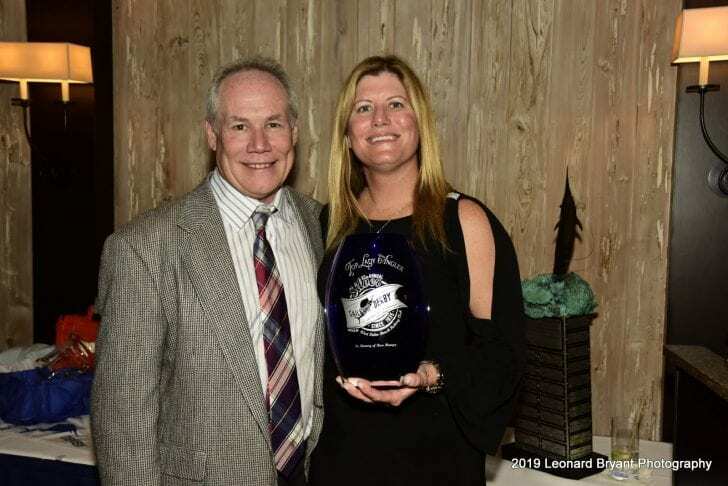 Sailfish Marina’s very own, Megan Johnson, was awarded the trophy releasing 4 sailfish aboard the smallest boat in the fleet, the BeachKomer a 25’ Competition. Not to be out done was Capt. Paul Sabayrac and the Goin’ Raptorcrew winning The Top Small Boat (35’ or less) with a strong finish landing 7 sails Day 2, ending with a total of 8 releases. Lastly, Danny Kleisley got it done on the 60’ Hatteras, Gratiot Beach, and was recognized as the Top Junior Angler of the Derby.